A lot can be learned from social networks such as Twitter, LinkedIn, Facebook and others. The challenge has been making sense of the huge amounts of data that are generated by these networks. It is not always a trivial task to do so. Marc Smith (a sociologist) has pioneered a graphics program, NodeXL, which synthesizes and clusters social network data. Following charts were created with NodeXL and publicly available twitter data. Instead of a complicated listening platform, NodeXL is able to synthesize, for example, Twitter feeds, and produce a relevant graphic and report. 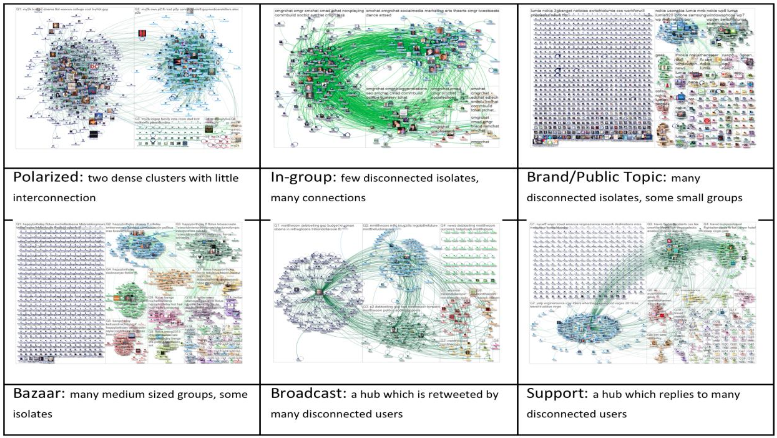 NodeXL creates maps that make sense of social media, and that is just the beginning. Polarized Network: Most often seen in politics or political issues, this pattern emerges when two groups are split in their opinion on an issue. Two dense clusters with little interconnection. Group Network: Seen at conferences and among tightly knit groups of people, this type of network rarely ventures outside of its membership. Bazaar Networks: Bazaar literally means ‘marketplace’. These networks were named for their diverse Twitter clusters. Broadcast Network: This is another very useful Twitter map, called a broadcast map. In a broadcast map, an individual account dominates the map. Support Network: Think customer support. These types of networks are known to be good at customer service. There are some interesting examples in the paper that I encourage all to read. This is especially useful for marketers who have a social media strategy in place and do not know (other than summary stats) on how their social marketing strategy is working. Once you can see the social interactions you are in a better position to shape the interactions to suit your goals. A good example is that a consumer goods company who has a robust social media strategy might be unpleasantly surprised to see that they have a "Broadcast" pattern rather than a "Bazaar" or "Brand" profile.